The IQAir HealthPro is designed for professional allergen control. Every HealthPro Compact is guaranteed to capture and retain at least 99.97% of all particles equal to or larger than 0.3 microns and at least 99% of all particles even smaller than 0.3 microns. Every HealthPro is guaranteed to capture and retain at least 99.97% of all particles equal to or larger than 0.3 microns and at least 99% of all particles even smaller than 0.3 microns. The IQAir HealthPro Plus is designed for professional all-around air cleaning. the Perfect 16 is seamlessly retrofitted into your home's existing heating and/or air conditioning system. 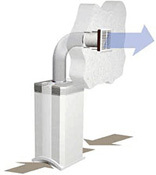 It cleans 100% of the air in your home with the highest rating possible, MERV 16. The price of Perfect 16 System includes pre-installation evaluation, actual installation, post-installation testing and verification. A refundable deposit of $295 is required. Prices reflect a single Perfect 16 system and includes installation fees on an existing HVAC system in good, functional condition with existing ductwork. The replacement schedules listed below are estimates based on typical usage. Each IQAir air purifier has an Intelligent Filter Life Monitor that takes actual use and speed settings into account. The air cleaning units calculate the remaining filter life of each individual filter down to the hour.